How many safety hazards do you see? There are more than 12 in the image. Have you spotted them all? 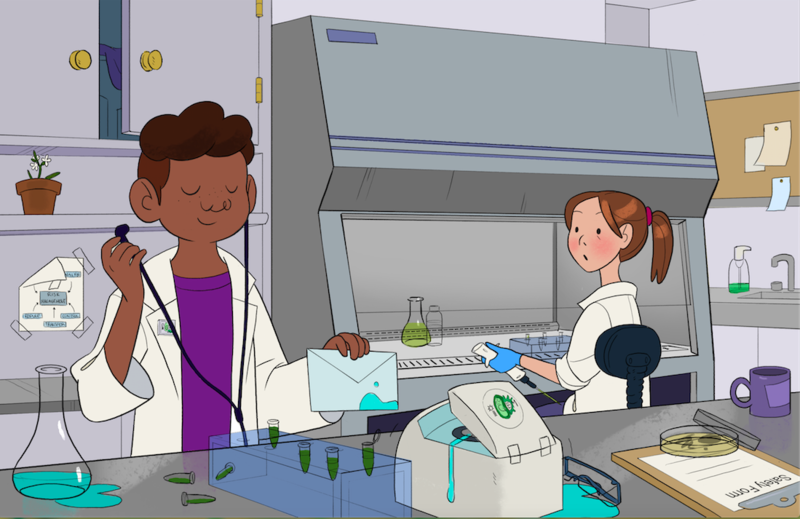 The picture shows a boy and girl working with non-infectious organisms like E.coli or yeast in a BSL1 lab. Wear your labcoat properly, the boy’s coat is open (1), the girl has the sleeves coiled (2). Gloves and safety goggles are not compulsory in a BSL1 lab, but may be needed when handling infectious material or when splashes may occur. There are many examples of contaminating your working area: spill on the bench (3), a centrifuge open with a spill on the rotor (4), open eppendorf tubes with bacterial cultures (5), an opened petri dish (6). Clean spills at once to prevent further contamination. Never eat or drink in the lab: your coffee at the bench is not allowed (7). Don’t apply cosmetics or contact lenses, don’t use your smartphone (8). Before leaving the lab, wash your hands with soap. And refill a nearly empty soap dispenser (9). Don’t have your lab journal on the working bench (10). Paperwork hanging on the wall (11) needs protection (e.g. plasticized) from contamination. Don’t block the air vents (12) with glassware or boxes. When pipetting the pipet with tip is kept within the cabinet (13). Sending biological material needs specific packaging. Beware of spills and contamination! (14) Plants are allowed in the lab when they are part of an experiment and housed properly. Don’t keep flowering plants (15) in this way! Biosafety is the safe use of biohazards to avoid exposure to you and the community, or release into the environment. Biosafety is achieved by knowing the risks, following the rules, and using proper equipment.